Instagram recently announced their intentions of reducing inauthentic activity. Their plan is to remove fake followers, comments and likes from accounts that use third-party apps to boost their numbers. Their method will be to use machine learning tools that can identify such accounts, similar to Twitter. 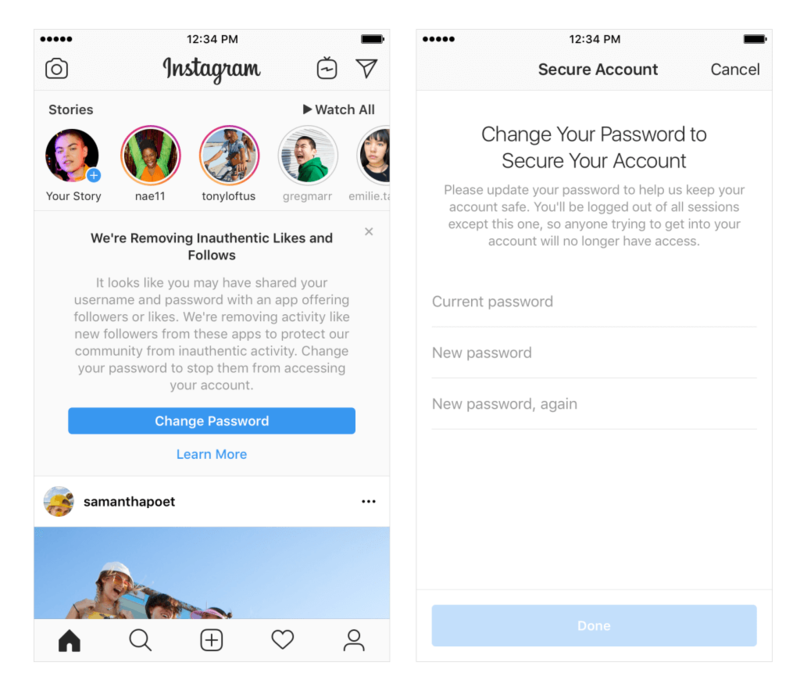 If Instagram spots a profile using third-party apps, the account holder will receive an in-app message to notify them that the activity has been removed. This means a lot of so-called ‘influencers’ could potentially lose that status. I can definitely see a positive from this as more and more businesses utilise influencer marketing – I have seen companies linking with an influencer, only to find out that their influence is as non-existent as the authenticity of their followers. Accounts that receive this message will be asked to change their password for data protection reasons. Many of these third-party apps request your Instagram password. That’s actually a really good idea, Instagram! In their announcement, Instagram stated that users who continue to use third-party apps may see their experience impacted. However, no specifics were given. It is uncertain how harsh the penalties could be – People may be risking a restriction on reach, account suspension or, worse yet, deletion! At the end of the day, third-party apps that create what Instagram class as inauthentic activity are very much in violation of Instagram’s community guidelines. One thing we know for certain is that this isn’t a one-off thing for Instagram. They will continue to pursue the cleansing of fake followers, likes and comments and because they’re using machine learning technology, it’s only going to become increasingly difficult for users to cheat the system. Keep checking Instagram’s press website for more announcements on how they will be tackling this ongoing issue.